Strength training has been highlighted not only as a way to build muscle, but also as a way to reduce injury and promote weight loss. Since fat is burned in muscle, the more muscle we have the more fat we burn. 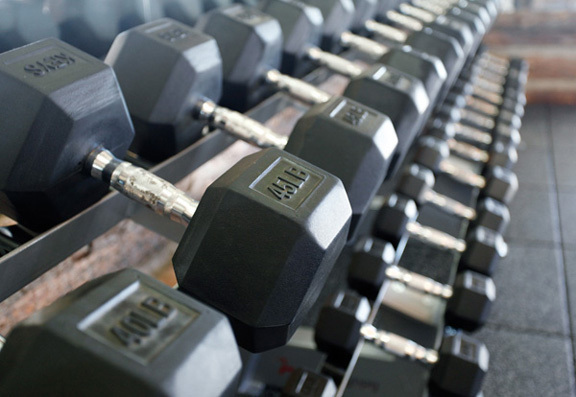 There are several ways to add strength training to your exercise routine. 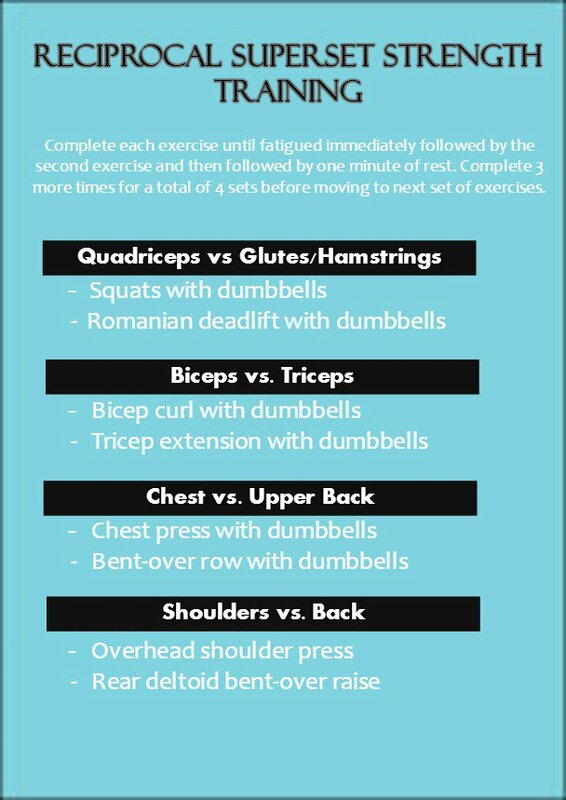 Some people prefer to work specific muscle groups on varying days (i.e. legs and glutes on Tuesdays, arms and back on Thursdays) while others prefer to do total body training a few days a week. Regardless of what type you do, adding any kind of strength routine will be to your benefit. A recent study published in The Journal of Strength and Conditioning Research revealed that reciprocal superset training not only builds strength, but also torches calories in less time than traditional strength training. Traditional strength training refers to completing a set of single muscle group exercises until fatigued followed by a significant period of rest whereas reciprocal superset training uses consecutive sets of two exercises that target opposing muscle groups followed by a short period of rest. Incorporating reciprocal strength training into your routine challenges your muscles and torches calories due to the short period of rest in between sets. Maintaining an elevated heart rate with less rest period also adds a cardiovascular component to your strength training which leads to increased calorie burn and conditioning. You’ll also reduce your total workout time by completing back-to-back sets consecutively while still completing the same amount of reps as single sets. I love this concept because it makes so much sense… how can I do a reciprocal exercise for my core? I feel like I have a weak core and back since having babies. Every time I do an “ab” exercise, my back is more sore the next day then anything. Would this help? Great question, Jamie! The opposing muscle group for the core is the back (particularly the lower back). Although we love our little ones, I’m sure any woman who has been pregnant would agree that their core is not as strong as it used to be. As a result, we tend to use our lower back muscles to compensate for our weak core. This would explain why your back is more sore the next day than your abs. Applying recipricol superset training to the core and back muscles would include completing an exercise that targets the rectus abdominis muscles (i.e. crunches with knees bent at 90 degrees and low back pushed into the floor) immediately followed by the superman exercise. Both of these exercises are explained in detail in the Fuel Your Body section of the website. Hope this helps!